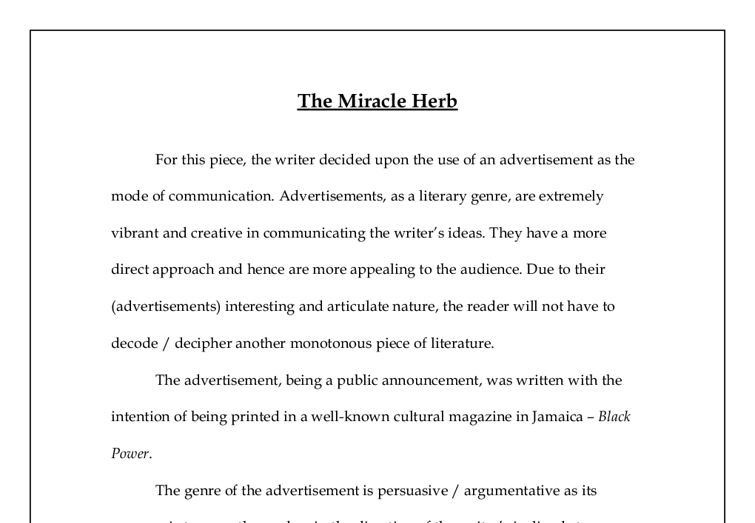 The Miracle Herb For this piece, the writer decided upon the use of an advertisement as the mode of communication. 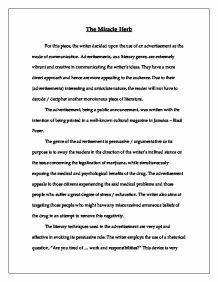 Advertisements, as a literary genre, are extremely vibrant and creative in communicating the writer's ideas. They have a more direct approach and hence are more appealing to the audience. Due to their (advertisements) interesting and articulate nature, the reader will not have to decode / decipher another monotonous piece of literature. ...read more. The advertisement appeals to those citizens experiencing the said medical problems and those people who suffer a great degree of stress / exhaustion. The writer also aims at targeting those people who might have any misconceived erroneous beliefs of the drug in an attempt to remove this negativity. The literary techniques used in the advertisement are very apt and effective in evoking its persuasive role. The writer employs the use of a rhetorical question, "Are you tired of ... ...read more. Ellipsis is used to deliberately slow the reading and bring the readers' focus to the main points. It is also effective in conveying the diversity of possible medical benefits to be gained from the use of marijuana. The advertisement is written in the acrolectal variety of the Jamaican Standard English. The writer's use of the colloquial expression, "ganja" to refer to marijuana is apt as it is an informal expression that is of a high level of comprehension. It in turn, authenticates the Jamaican dialect of English and will make the communication process more effective. ...read more.